Reflect: When was the last time you asked for help? 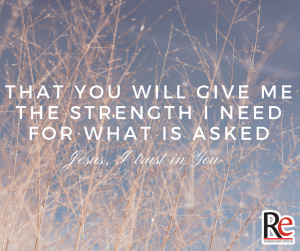 Asking another for help – and especially turning to God for help – exposes our dependence. This can be a frightening realization in a world that fosters a spirit of independence. Yet it is precisely our dependence on God that disposes us to recognize everything as a gift of his grace. Asking for help can also make us face our hidden motives: for example, am I unwilling to ask for help because I want to look competent or be commended for my own accomplishments? In all that we are asked to do, may we follow Saint Paul’s advice to the Colossians, “Whatever you do, do it from the heart, as for the Lord and not for others” (3:23). Share: Next time you have a task or responsibility that you find overwhelming, ask someone for help. Then, as you begin your work suggest that you say a prayer together, placing it in God’s hands, trusting that God will give both of you all the strength you need to do what He is asking. 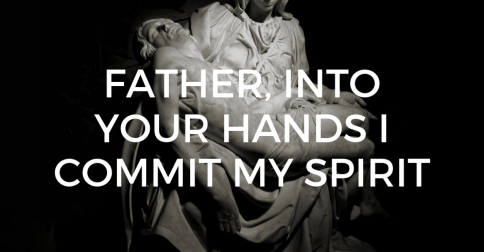 Pray: Pray the Litany of Trust in the morning and at night. Download it here. Reflect: God loves us so much that He chooses to be our savior. There is no depth of darkness that His light cannot reach. There is no wound that is too deep for Him to bear, or to heal. God knows us beyond anything we can possibly imagine, and we can’t go anywhere that God can’t. We just have to welcome Him into our lives and accept His love and His healing. Share: Write a list of everything you are thankful for. Pray over each item and thank God for that blessing. Pray: Pray and ask God to reveal His love for you in your life. Reflect: Children allow themselves to be held, to be led by the hand. They are aware they cannot provide for themselves and are willing to ask for what they need and want. So often, as we grow older, dependence is seen as a limitation, a limp, a sign of incapacity or even laziness. We are taught to muscle through things, to get it done- and if you want it done right, by yourself. 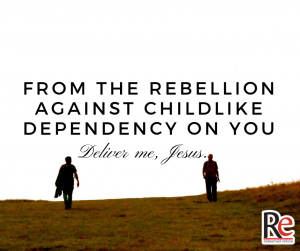 Jesus tells us we need to become like children to enter the Kingdom- not childish- but utterly and happily dependent on the Father who gives good gifts to His children. Share: Practical suggestion…Find a place where you can be “alone with the Father who sees you in secret”- close the door and make yourself small. Sit on floor, or lay prostrate or kneel- become little- and whisper to Him sincerely and plainly what you feel like you need- physically, mentally, emotionally, spiritually. Tell Him what you have a hard time with, what you resent, what you regret and ask Him to give you the grace to surrender everything into His hands in trust. Reflect: God is a Father who delights in the words spoken by His children, every single word that is spoken to Him never goes unnoticed. 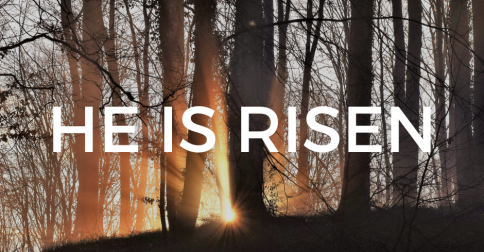 He hears our stories, our fears, our requests, the unspoken words in our hearts. 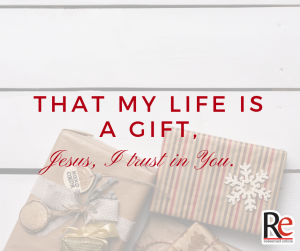 He is a Father who is deeply in love with His children.To trust that He is listening and responding, even when it seems that He is silent takes a great act of faith and that act of faith is like a precious gem in the hands of God. 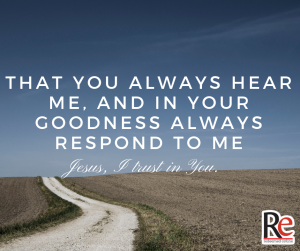 Today, abandon yourself into the Father’s hands with a bold confidence that He is listening and in in His goodness always responding. Share: Today, look for ways God is responding to you whether that be through the kindness of others, in creation, through scripture or however He desires to surprise you today. Then write them down and recall them through the rest of Advent. Reflect: Discouragement knocks us down. It takes away our motivation, it makes us feel unworthy or incapable. Discouragement prevents us from seeing the truth about ourselves, and our situation. 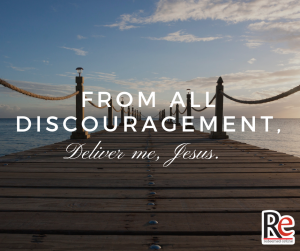 Discouragement is not from God. The voice of the enemy discourages, while the voice of God encourages. When you feel discouraged, reject the devil’s lies, and give your frustrations to God, asking Him to show you the truth. Share: Being honest about our discouragements can be difficult. Be bold today, and share your discouragement with another person. Allow them to encourage you. When someone shares their discouragements with you, remind them of the truth about who they are in God’s eyes.